Recently my cousin gave my a rather peculiar looking squash from her enormous garden. A little intimidated by the vegetable I had never seen before I thought I should find a recipe that called for summer squash. Since it didn't look like the normal squash I was used to cooking I wanted to make sure that the recipe I found would be one that was actually created with this exact vegetable in mind, so for Sunday dinner I decided it was finally time to tackle this hurdle and get on with it! Like all good southern dishes it was cheesy, buttery and delicious, and we had successfully removed all redeeming health qualities and replaced them with BUTTER! It was as gluttonous as some recipes I have made but it was no lean cuisine either! In the end it was a lovely addition to our steak dinner with a green salad and sauteed mushrooms! Preheat oven to 400 degrees F (200 degrees C). Place squash and onion in a large skillet over medium heat. Pour in a small amount of water. Cover, and cook until squash is tender, about 5 minutes. Drain well, and place in a large bowl. 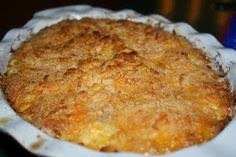 In a medium bowl, mix together cracker crumbs and cheese. Stir half of the cracker mixture into the cooked squash and onions. In a small bowl, mix together eggs and milk, then add to squash mixture. Stir in 1/4 cup melted butter, and season with salt and pepper. Spread into a 9x13 inch baking dish. Sprinkle with remaining cracker mixture, and dot with 2 tablespoons butter. Bake in preheated oven for 25 minutes, or until lightly browned. When I made this it fit into a 9x9 dish easily.